View from balcony with Ocean Shores in the distance. Oceanfront view from living room. Spacious furniture perfect for lounging. Large picture windows and flat screen TV in living room. Open floor plan with gaming table. Ocean front view from living room. Seating for six in dining room area. Seating for six in dining room area and 3 bar stools at kitchen island. View from dining room area looking toward living room. Large open kitchen with modern appliances. Kitchen offers open floor plan perfect for family. Master bedroom with large flat screen TV. Master bathroom with large soaking tub. Large soaking tub and shower. Enjoy the spectacular views of the Pacific Ocean in this premium beach home. Relax on the deck for unobstructed views of crashing waves and glorious sunsets. The oversized picture windows let you enjoy storm watching at its best from the comfort of a cozy chair. In calmer weather, throw open a window and let the sounds of the ocean lull you to sleep. The spacious kitchen overlooks the living and dining areas and is perfectly suited for multiple chefs. The owners of this condo enjoy cooking and entertaining friends so you will find a large selection of dishes and glassware perfect for having friends over from other condos. Another great addition to the kitchen is a professional wafflemaker so don't forget the syrup. Enjoy a warm soak in the master bathrooms large jetted tub after a brisk walk on the beach or a daring dip in the ocean. In addition to all the comforts of home in your beach vacation condo, your stay with us includes total access to all the amenities our property has to offer. This includes a large hot tub, heated seasonal swimming pool, barbeque grills, and 24 hour access to the well equipped exercise center at the clubhouse. There is also a large grassy play-field perfect for the kids, a basketball court, putting green, horseshoe pits, and playground for the little ones. Sports equipment is available for checkout at our Front Desk. Soak up the sunshine and relax on one of the many park benches and watch the activities. No worries, its time to have fun at the beach! Had a wonderful time watching the weather from the living room of this beautiful home. I was a bit worried that it was a pet friendly unit, but it was clean, smelled like new and was very comfortable. The kitchen had everything we needed to fix our own meals. The beds were very comfortable. Easy to get to the beach and walk a long way! Thank you! Everything was so wonderful! The condo was warm and inviting when we arrived - soft music was even playing! We got to experience both sunshine and a violent storm so that was fun too! ocean. The unit is quiet and the beds comfortable. It was a wonderful week. I love the view and all the amenities. We played the games provided, watched TV at night, and enjoyed the view during the day. We all want to come back! Excellent choice for your next get away. The unit is impeccably clean, well maintained and very comfortable. The entire complex is very nice. We are seniors, myself in a wheel chair, so we appreciate the wider walkways and elevator. I brought my shower chair and was able to bathe without too much of an issue. Westport is cute but don't expect fine dining. Management was also very helpful when we needed to change our reservation. Do not hesitate to book this property. Incredible views and dog friendly! Great location with beautiful close-up views of the ocean waves. Easy access to the beach or there's also a paved path nearby. Very clean and comfortable. We'll be back! We were fortunate to have great weather and you can't beat the view of the ocean. Lots of great walks and fun. Agreed, this condo has one of the best views on the entire Washington Coast! Glad you could ring in the New Year with us and hope to see you again soon. Wonderful time at Westport by the Sea again this year. Accommodations fit multiple families with plenty of space, things to do, and gathering places. Weather was fair this year, but still got some beach time. We rented this condo for our family of 5- 2 parents, and 3 kids (ages 10 and under). It was great!! The view is spectacular and beach access is easy. There was plenty of room for the 5 of us. We used the community pool and hot tub a few times. And walked/road bikes along the paved path through Westport Light State Park. My kids were disappointed to leave after our quick 3-day weekend to the beach. Hope you can make it back soon, thanks for staying! Absolutely perfect room, amazing view. Made me fall in love with Westport. Absolutely relaxing peaceful fun and couldn't take our eyes off the waves! Thanks for staying with us, you chose a truly amazing condo with an ocean view that can't be beat. Hope to see you again soon. Located right on the beach. Great community, paved bike path all the way to town, or walk on the long sandy beach. Condo was clean and well stocked. Great. Owner of this unit does an excellent job of keeping it well stocked with everything that is needed. The maintenance staff does a super job of preparing the unit. We are looking forward to 2017. Truly Awesome. This must be what heaven is like. The condo was beautiful. The oceanfront view was magnificent. You are yards from the beach. I have never seen so many sand dollars. We could watch the little sandpipers for hours. The bike and walking trail to Westport just yards away. Can't recommend this place highly enough. This is the second time our family has stayed in this lovely two bedroom, dog friendly unit. The unit is spacious and the decor is eye catching yet practical without being stuffy. The kitchen is well appointed. Guests want for nothing. The ocean waves and beach are straight out the front window--the view is stunning. It is hard to leave and we will definitely return. We thoroughly enjoyed our family getaway to the beach. The picture window was breath taking and we all spellbound watching the waves crash on the beach. The unit was clean, spacious and well equipped for everything we needed. We will definitely be back! Condo is well prepared with everything you need to relax with family, prepare meals, and enjoy every minute inside and outside. The condo was much bigger than we were expecting and beautifully decorated. It was nice to have a kitchen to cook meals in and to have plenty of room for the kids to hang out. The place was better than described and clean. Would definitely recommend this property to a friend! We enjoyed the property - all aspects were excellent. We loved our stay and have all 4 times we have stayed!!!!! The condo was perfect! A place to return too. I rented the first night and my daughter and her family picked up the remaining 3 nights. She and her family, they were delighted with the unit, it met all their expectations and then some, their intention is to return next year. Condo was tastefully decorated and had a fantastic view of the ocean. Kitchen had everything we needed. Excellent experience! The best place to get away in West port. I love it. We love this place so much. We go to Vacation By the Sea every time we go to that area. Clean Beach, clean rooms,this time I loved my room because of the better view. I will come again and again. I even loved the weather this time. I miss that place already, I wish I could get better discount & stay for a week. Our computer didn't work there, don't know why. We just had small grocery shopping problem this time. See you guys later. We stayed for 3 nights over labor day weekend. The condo itself is nice, decorated beautifully, however not very clean and a few things needed some maintenence. We called the management and they fixed the issues right away. Even though the condo is pet friendly, the carpets could use a shampoo. Weve stayed several times in the past and had a great experience, sometimes these things happen. I would definitely recommend and will continue to go every year. Thanks for staying with us and happy we were able to take care of those few minor things during your stay. We do our best to spot clean the carpets between guests but this is one of our most popular pet friendly Oceanfront condos so it can be challenging to squeeze that in since it take a day or two to fully dry. See you next time! This is the third time that we've booked a stay with Vacations by the Sea. Once more, we were very happy with our experience. Our rental had a gorgeous view, the best we've ever had. It was nicely furnished and the kitchen was well equipped. This unit allowed for dogs, which was a huge plus for our family and our beloved black lab. The grounds are well kept up, and access to the beach, the walking path toward Westport, and the recreation facilities on site are excellent. Our daughter loves the pool and the sport court, etc. We will continue to visit these condos, since we are three for three for positive experiences here. The condo was perfect for two people and two dogs. Great view with nice balcony. Comfortable seating, good beds. Kitchen had everything we needed. Would definitely request this unit on our next trip to Westport. The condo was fabulous. The person who took our reservation was wonderful and friendly. Due to car repairs we were unable to check into the condo until tuesday night 7/15/14 at 8:30pm. This was a birthday getaway to decompress. We kindly requested a late check out with our reservation and was told that the condo was not being rented until friday and it would be no problem to check out on 7/17/14 by 2pm at no additional charge. We were told to call thursday morning to let the association know. (we were impressed with the generosity and service) I suffered a minor concussion on 7/16/14(my birthday) and had to have bed rest that day. We were looking forward to the late check out due to our circumstances. When I called thursday for the late check out, I was first told they could only let us check out at noon and I explained what I was told to us when we booked our reservations and she was quite frank and would not honor the request. She then told us we could check out at 1pm. I did not want to argue with her. (poor customer service) The thing that bothered me and my family the most is that the custodian/cleaning person showed up at 12:15pm when we were promised 1pm. He stood outside our door; not giving us privacy. I was trying to take a shower and use the bathroom and finish packing etc. This was quite akward and uncomfortable. We think we will rent direct from Ken direct next time(he owns the condo above 724) The condo was EXCELLENT. The empty promise left a bad taste in our mouth. Thanks for staying and sorry to hear about your misfortune while you were here. Unfortunately we cannot guarantee a late checkout when the reservation is made because reservations which may happen afterwards and we need adequate time to resupply and clean each condo between guests. I believe the reservationist would have said to call us the morning of departure to confirm if a late checkout was possible since that is our policy and since she said a noon checkout was the best we could do confirms another guest was coming into the condo the day of your departure. Our staff did drop off the bag of supplied for the condo at 12:15 but then left to attend to other duties to return at 1pm which is the latest we could accommodate. There are other rentals on property but I believe we offer the cleanest, best furnished condos here and we are committed to customer service and satisfaction as evident from our many positive reviews. Awesome view and location. Great clubhouse, pool, and hot tub. Condo was clean and very comfortable. Only feedback: new / bigger toaster for unit 724. Great spot to watch the ocean! We enjoyed our stay in this well appointed condo with the great view of the ocean. The grey whales were migrating, and we could view them with binoculars from the living room window. Highly recommend this property. This was a birthday celebration with another couple and our dog. My husband was turning 69 and he loves to surf, thus we always go somewhere on his birthday where he can do that. And, we love to take our dog with us, so Vacations by the Sea is a perfect spot. We thoroughly respected the owner's condo, washing out dog outside each time we came back from the beach and then toweling her off well. She is not a stinky dog and that always helps. The condo was well outfitted with everything we needed....except for one small item. A good box grater would have been wonderful. Next time I will bring my own. Knowing a waffle iron was there we made waffles and had a great breakfast. The harbor was great for keeping us supplied with fish and we fixed up some great meals. We'll be back. This was our second time there, but the first to bring another couple. We also took advantage of the swimming pool. All in all a great facility! Very spacious, luxurious condo! Great. well supplied kitchen. Lovely view. What more could you ask for? Maybe an attractive weekly rate? A weekend is not enough! Another Great Vacation in #724!!!! We were @ Vacations By The Sea last year and it was wonderful & this year (2013) was just as great. Our whole family goes (Mom, sisters, brother & their families) and we all love it! I for one could live there always!!! Our two bedroom second floor condo was perfect for our family. The kiddos enjoyed walking along the beach searching for sand dollars with our dogs and drinking hot cocoa on the balcony. We saw millions of birds flying north a few feet above the ocean waves about 80 yards off shore. This was right about dark. Would really like to know what birds they were? Peaceful, restful and beautiful. The walk to town is delightful either by land or on the beach - we did both. Highly recommend for a quiet restful stay. 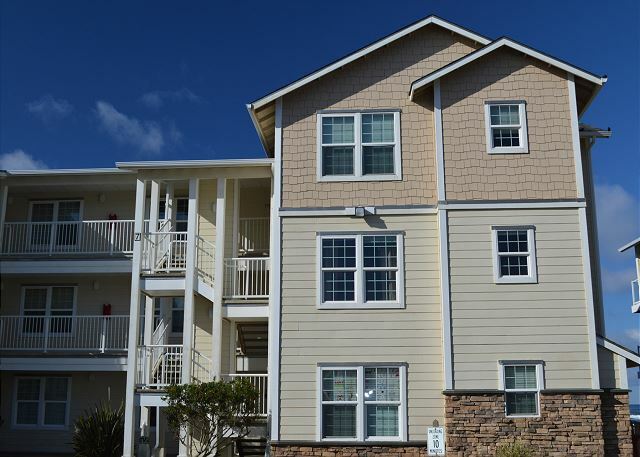 We enjoyed this beautiful unit with a superb view of the ocean (we even saw gray whales from our living room). The clamming was good too. One suggestion: please consider getting a coffee maker that makes 10 to 12 cups at a time. Thanks for staying and we are thrilled to hear you saw gray whales passing by from the living room window! March - May is when they are heading north for feeding in the Bering Sea and many guests are lucky to see them. See you next time! Overall, our stay was exceptional. The master bathrooms sink was plugged so it took forever to drain when you brushed your teeth. Also there is a broken glass light shade in the living room. We were impressed with the cleanliness of our unit and we loved the location to the ocean. Thanks for a great time. Thanks for staying and for letting us know about the slow sink. Both of these issues have been resolved and we encourage guests to let us know right away if there is a problem and we'll do our best to take care of it right away. We always want our guests to leave with the most positive experience we can offer. See you next time. My sisters and I wanted to have a fun relaxing weekend and Vacations by the sea condo was the perfect place! Great weather and beautiful beaches to walk all day with our dogs . We will be back for sure! Very nicely decorated and comfortable. Fireplace added nice touch since it was foggy and rainy. I have two suggestions, one, the pillows in the master bedroom could have been higher quality and because this unit boasts a professional waffle maker that we used, you need to supply some cooking spray. Glad you had such a great stay. Thanks for letting us know about the need for some more spray, we'll get that right into the condo for our guests! See you again soon. I stayed 6 nights and I wonder if there was a weekly rate that I could have been charged that would have been less expensive. The unit had a wonderful outlook, the weather was wonderful. It is so relaxing being at the Ocean. Thanks for staying with us and we're glad you enjoyed the view and weather while here. The weekly discount off the nightly rate starts at 7 days and varies depending on the season. We hope you can stay for us as long next time or longer! We thoroughly enjoyed our stay in #724--the large living room window looked directly out to the ocean which was amazing! We will definitely be back! We had a great time, and enjoyed the sounds of the surf and being so close to the beach. The barbecues need attention though. Thanks for staying at Vacations by the Sea in Westport and we're glad you had such a good time. This is a favorite condo with many of our guests because of the amazing view and how close it is to the beach. We'll check with the property maintenance folks about the barbeque. See you again soon! This condo was just right for 4 adults and 2 dogs. The beach was great, the pool was heated and we grilled our Bay City Sausages on the barbeque at the club house. 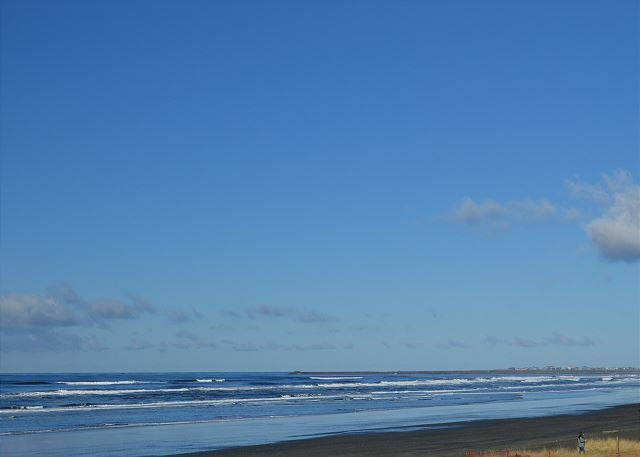 We explored the Grays Harbor Light House and the dog-friendly Westport Winery. Unit 724 has a great view, but it could use some updating –needs a full-size coffee maker, new bedding and had many locked cabinets. We had some problems with the internet connection, but that was quickly resolved by the nice folks at the clubhouse. Thanks for having a dog-friendly environment, but make sure ALL guest understand this ahead of time. We will be back! Thanks for staying with Vacations by the Sea! We're glad you enjoyed your stay, the Lighthouse & the Winery. Some of our owners, especially those that visit often, like to keep things at the condo that aren't meant to be shared, hence the locked cabinets. We'll talk to the owner about making those updates, and appreciate the feedback. Thanks! We loved the condo and everything was so very nice, THANK YOU! The only thing I would suggest is there is a crack in the jetted tub/Master Bedroom. I didn't use the tub other than showering because of that. If that is not properly repaired the cost will be terrible due to structure damage to the condo. Other than that, we loved our stay as usual and will return! We're glad you had such a wonderful stay. Luckily the crack in the tub is just cosmetic and will be repaired very shortly. We hope to see you again! Vacations by the Sea is our home away from home. Loved it! We've never had any issues with loud attendants above us in the four years we've stayed except for this year. The front office handled it within minutes and the loud music was turned down. The rooms are always top notch and beautiful! We look forward to our next stay this summer! Love the beach access and friendly staff! Thanks for the hard work. Loved every minute. This is Brenda's husband Mike our stay was great we had been there 3 times before and have not had a disappointing time. This is my answer to you about our stay. Now could I have an answer from the owner on the information I left about Wolfhaven? I called and the manager was going to send him an e-mail for him to get in contact with me. Hello Mike, thanks for giving the condo such high marks. In regards to the donation solicitation in the condo review, Vacations by the Sea does support many charities and organizations in our region through donations as well as gift certificates for stays in our condos. We do like to support organizations who's members support us and appreciate your repeat business. I plan to contact Wolfhaven,org regarding a membership for my family because I believe in the good work you and the organization are doing to provide sanctuary for the wolves in your care as well as educating the public about the benefits of having a balanced ecosystem. The Pacific Northwest is an amazing area with so much natural beauty and diversity and I'm happy to support worthy organizations such as Wolf Haven International in Tenio, WA. Thanks for staying with us. Four of us had a wonderful Christmas staying at this condo in Westport and are already trying to decide our next vacation to this same location in Westport. Bldg 7 was a wonderful location. Thanks for staying with us and we're pleased you had such a wonderful stay that you are already planning on coming back! Happy New Year. The view was awesome, the condo was clean, well stocked with utensils and comfortable. The walk to the beach was a quick 5 minutes. The only thing I can recommend is a check -in/out list for us to fill out for things like the round spot on the front window sill which could have been a cup or mug which was hot. The other damage we found was the bathtub which had a gouge or cut in the master bedroom jacuzzi tub. It had a yellow plastic film over it indicating a repair was done or attempted. Because these units are owned by others it would be nice to have a check-in/check-out of things that may need repair. We had no initial walk-through nor a check-out walk through. Other than that the stay was relaxing and we felt at home. We'd rent this unit again. We're happy you had a great stay with us in Condo 724 and found everything to your liking. Since this is a vacation rental, we do extensive checks after cleaning, before, and after guests stay so we keep on top of any maintenance or damage issues which may come up. Guests are never charged for any damage they are not responsible for causing. A detailed checklist of our check-out procedure is posted on the back of the door for our guests to follow but we always appreciate a heads up on items which may need our attention. Glad to hear you'd rent this condo again and we hope you can visit again soon. in 724 again. Also, the TV was top notch! A perfect location for northwest beach lovers. Stroll, beach comb, fly kites, enjoy a bonfire & relax to the sound of the waves till your hearts content. Accomodations gave every option for any vacation style. Just minutes to restaurants, ice cream shops and fresh seafood markets in Westport. Our oceanfront unit fit our family of 4 adults, 2 children and our dog beautifully. The spacious open concept gave way to views at all angles. We comfortably enjoyed games and movies in the living area and family dinners in the dining ares. The open kitcken was perfect and bar seating was great. It's a terrific treat for out of town guests. We look forward to visiting the property again. We recently stayed at unit 724 and had a wonderful time. I wrote in the owner's comment book that their unit was the best equipped and most tastefully decorated unit we have ever seen in over 15 years of being active vacation home renters. Our only complaint was a classless group that took over the hot tub and did not have waterproof diapers on their two young brats. I recommend changing your pool area signs to remind people like we encountered to be considerate of others who do not want to sit in pee water. I would also recommend not allowing kids under 6 in the hot tub at all. Thank you very much for the excellent review! We're very excited to see this condo recieved such a glowing compliment from somone with so much experience renting vacation homes. We'll be sure to pass on to the property management the need for better signage regarding the hottub. Hope to see you again soon! It's a great unit and we had a wonderfult time. The view was incredible. Thanks, again. We mentioned to the front desk that a screw was loose on the dishwasher, so that it was loose and tipped forward when we opened it. In case it hasn't been repaired you might wan o check. Thanks for the great review and mentioned in the problem with the dishwasher. We took care of it as soon as you let us know while you were out. Hope to see you again soon! The reservation process worked smoothly and we arrived and were immediately able to access our unit. It was very clean and the location was outstanding. We were with friends from France who wanted to stay on the ocean and this provided the perfect opportunity. We would definitely stay again. We are glad that everything went smoothly and you enjoyed your time at the Beach. Thanks for staying at Vacations by the Sea and we hope to see you again soon!! With my family of 5, It was less expensive for us to stay at the condo than it was to get 2 rooms at a hotel on the holiday weekend. The condo was clean and inviting. The view was spectacular! We stayed in condo 724 - facing the ocean. The full kitchen was so helpful! The cheese slicer was surprising, needed find! My girls LOVED the wine/brandy glasses. The master bed - UGH! that was the only less than perfect part about the stay. I NEED a firm bed, but, I think that the tile counter tops in the the kitchen have more give to them than the bed. This was my second time staying in this condo, and once again, I was completely satisfied! The view from this condo is stunning, and the unit itself is beautiful and spacious. I would definitely stay here again! Had such a wonderful experience with Vacations by the Sea. The room (724) had an amazing view. It was such a experience to wake up to an ocean view. Would highly recommend this unit to anyone. We stayed in unit 724, which was right next to the beach and had a completely unobstructed view. It was so relaxing to watch the sun set over the horizon and listen to the surf at night. I've stayed here before and I really like how well-maintained and clean the units are. It's a really nice place to stay and the location is close enough to Seattle that you can get there after work on a Friday. everything was 5 out of 5, except the check out times. im sure you have to deal with clean up the next day, but if you could work a later check out, i'm sure you'd get people coming for that reason. overall, great. We're glad you had a great stay with us. We do allow a noon checkout if requested on the day of departure and if another guest isn't checking into the unit that same day, however another guest was coming in right after your stay so 11AM was the latest we could accommodate and still have the room cleaned and ready for their arrival at 4pm. Hope to see you again soon! The location, condo, scenic view, peacefulness, view from the room, the sounds, this has been an overall unspeakable, no words can describe experience that I have ever had. Just from my backyard. I will go again. We've stayed in several condos on this property over the years and all of them have been great. This was our 1st time in this one and we loved it! The ocean view is amazing and worth every penny. We sat on the deck and watched the sunset sipping chilled wine from the little Winery right up the road. The flat screen TV was also a great bonus to watch the world cup matches. We will be back soon! This is a very beautiful condo and LOVED the beach themed dishes! We had a GREAT time here and not only will return but will recommend this to Everyone!!! Great vacation spot in Westport! Vacations by the Sea was a wonderful place to stay in Westport! We had an ocean view room and enjoyed the spacious condo. Gourmet dining at the Half Moon Bay restaurant and loved Bennett's in Grayland nearby! Would definitely go back!! This condo had a lot of room and was extremely cozy, but it was the view from the main window and balcony that was the best! The beach was literally right in front of us, which made for gorgeous ocean and sunset viewing from the comfort of the couch/chairs in the condo. Plus, the kitchen was beautiful and had everything we needed. Not to mention, the jetted tub in the master bathroom was wonderful! Overall, this is probably my favorite condo so far at Vacations by the Sea!! We spent our 35th Wedding Anniversary at Vacations by the Sea. What a wonderful relaxing time. This was our second trip to this property. From our first experience, we knew we were in for a treat. The property is well maintained. We had a great location with outstanding views. We will be making this trip an annual tradition.